VLC Media Player, a great open source software, is one of the most popular media players for it supports a wide range of video and audio formats. Its even better feature is that VLC lets you download and play YouTube videos directly. Here's how: Step 1: Find and copy video URL; Step 2: In VLC, click Media, and choose Open Network Stream; Step 3: Paste the link into the box and click Play. If you think that all these steps are as easy as winking, you'd be totally wrong because technical problems occur frequently. Here I gathered common problems and solutions. If these listed solutions don't work, try solution B, a YouTube to VLC converter that never fails to work. Hi, I found no answer to my problem with forum-search feature. If I open a YouTube video link with VLC, then appears right video title on VLC Window Title, but after 1-5sec disappears and looks like VLC reject it. Check whether you have copied the entire YouTube video URL, your operating process is correct or not. Try installing the latest version of VLC. Although VLC player is described to be capable of downloading YouTube videos, it delivers poorer performance compared with the above YouTube to VLC converter that also works as a professional YouTube downloader and converter, giving you a great chance to download movies , TV shows, any video clips, transcode YouTube videos to AVI, MP4, MOV, etc. playable in VLC. I have downloaded a new from YouTube, but my VLC Player is not able to play that video.I have tried with other players, but they are also not able to play it. I am able to see the video only in media player. What should I do? First, check out whether your downloaded videos are playable on your other media players or not. If yes, update your VLC to the latest version. If no, you should know what formats your downloaded YouTube videos are. VLC does accept a wide range of video formats but not everything, for example, VLC won't play MKV format, some 4K Ultra videos. VLC may even have trouble playing YouTube videos in MP4 format because of the request of copyright of the owner. I'm afraid that you should need a process of transffering videos to VLC. Fortunately, with the aid of a powerful enough YouTube to VLC converter, it just takes a few clicks and several seconds. You can refer to the detailed steps at the end of this article. It is a great news that VLC adds support for 4K video playback. Unfortunately, it does not always work out or works well. Sometimes VLC plays 4K video but without audio or subtitles. If you have encountered the same problem, try other high recommended media player . But format issues may be still sitting there. A better solution is to get an almighty YouTube to VLC converter, giving you a hand to download YouTube 4K videos, decode and encode 4K videos to VLC without any problems appearing or quality loss. It seems that YouTube videos are playable in VLC but with no sound. Then follow the solutions below. First, unmute your VLC media player. If it doesn't work, try adjusting audio settings. If the above solutions fail to work out, you should solve video format compatibility issues, which requires a right YouTube to VLC converter that is able to convert YouTube to VLC player and solve other problems, like VLC subtitles out of sync, VLC audio and video are out of sync, video is choppy, etc. Why You'll Love This YouTube to VLC Converter? VLC certainly is not a replacement for a much more powerful application, MacX Video Converter Pro, a top-notch YouTube to VLC converter, enabling you to convert YouTube videos to MP4, AVI, MOV, WMV for VLC, download and convert 4K videos, any HD videos on YouTube to MP4 playable in VLC player smoothly without quality loss. This robust software succeeds in transcoding among all video formats, like converting VOB to MP4, WMV to MOV, MKV to AVI, MTS to MP4, which gives you an opportunity to play all videos in VLC player without video format limitations. This advanced YouTube to VLC converter is far more than a one-trick pony because it also includes features of recording screen, making photo slideshow, editing videos, like cropping, trimming, cutting unwanted areas, adding watermark, adding SRT subtitles, etc. You'll be quite happy to find that the whole YouTube to VLC conversion process is dead easy. Step 1: Load video files. Download and launch YouTube to VLC converter. click "Add File" button and locate the files that you want to convert to VLC player. Step 3: Select output folder by hitting the "Browse" button. Step 4: Start YouTube to VLC conversion by clicking "RUN" button. Step 1: Paste the YouTube videos URL. Hit "YouTube" button. Clicking "analyze" to load YouTube videos you are going to download by copying and pasting the video URL from YouTube. Or clicking "paste & analyze" button to automatically detect videos open on website page. Step 2: Specifying an output folder on your Mac to save the output files by hitting the "Browse" button. Step 3: Click "Download Now" and start downloading. Note: To convert YouTube videos to other video formats playable in VLC, select "Auto add to convert" and later the software will automatically jump to the conversion page. 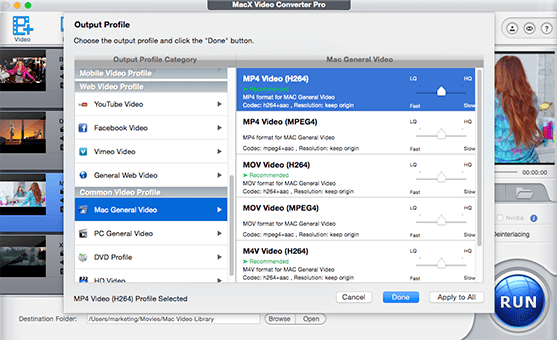 MacX Video Converter Pro is the best YouTube to VLC converter, which can easily convert YouTube videos to VLC supported formats like MOV, MP4, M4V etc, along with excellent YouTube video download feature.